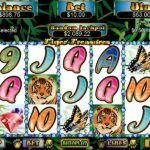 The Tiger Treasures video slot by RTG is a game based on the amazing wildlife of China. The game features pandas, butterflies, and of course, tigers! You will be awarded prizes when they all show up. You can also win more when you find rubies. There are many bonus features in this game, such as the prize multipliers, wild tigers, free games, additional wilds, and scattered Chinese writing. There are many bets that you can make to create the perfect betting environment. The minimum bet is 0.01 coin per spin. It is perfect for those who are watching their pockets while they play. The game heads you off into a jungle where you will have the choice of 20 paylines with 5 reels. There are many lettered and numbered symbols that you will come across even as you spot the other wildlife. The symbols can get you a prize of 200x your line bet. The prizes keep increasing with butterflies worth 500x your bet. The pandas pay even more with 1,000x the bet. If you are lucky, you might even find some rubies which are worth 1,500x your bet. You will find the tigers on the second or the fourth reel. These are wild and can replace the other icons to help you win more prizes. These prizes can even be tripled. The Chinese Writing Symbol is the scatter symbol that can multiply your total bet by 2. The numbers increase with the increase in the symbols. 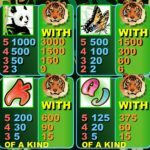 3 or more symbols will get you up to 25 free games where the wild tigers may be seen on the third reel. This will help you get even more prizes. 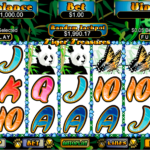 This slot game is a very nice presentation of the beautiful Chinese jungles. The huge bonuses and the prizes offered don’t hurt either! For another great and engaging game you should consider playing Super Diamond Mine by RealTime Gaming.